Measurements of the “fossil” light known as the Cosmic Microwave Background (CMB) have provided a spectacular snapshot of the very early Universe, reflecting the small non-uniformities that seeded the galaxies. This lecture will review the theoretical mechanism of Cosmic Inflation, in which Quantum Mechanics and Relativity combined at the Big Bang to create the CMB’s fractal-like pattern across the sky. The lecture will describe how future precision measurements of the CMB, as well as new cosmic maps observable in electromagnetic and gravitational waves, may provide deeper insights into critical early stages of the unfolding of the Universe, including the birth of the modern forces of Nature from their primeval, possibly higher-dimensional, ancestors. Raman Sundrum is the John S. Toll Chair and Distinguished University Professor of Physics at the University of Maryland, College Park. He also is the Director of the Maryland Center for Fundamental Physics (MCFP). Previously, he was the Alumni Centennial Chair in the Department of Physics and Astronomy at the Johns Hopkins University. 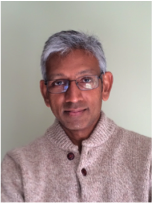 Raman works on theoretical particle physics, primarily the structure of the fundamental forces of Nature and their connections to possible extensions of Relativistic Spacetime, such as Supersymmetry and Extra Dimensions. He also studies their possible roles in the very early Universe. His focus is on uncovering new mechanisms at the intersection of Quantum Mechanics and Relativity. His research provides theoretical templates for a broad range of experiments, from searches for new particles at the CERN Laboratory’s Large Hadron Collider to precision cosmological measurements. Among other honors and awards, Raman is a Fellow of the American Physical Society as well as the American Association for the Advancement of Science, the recipient of the Department of Energy’s Junior Investigator Award, was Distinguished Visiting Chair at the Perimeter Institute in Waterloo Canada, and was a Moore Fellow at CalTech. He also has been awarded the 2019 Sakurai Prize for Theoretical Particle Physics of the American Physical Society along with his former collaborator, Lisa Randall of Harvard University, for their pioneering of what are now known as the “Randall-Sundrum” theoretical models of higher-dimensional spacetime, and for motivating a host of experimental searches. Raman earned his BSc in Mathematics at the University of Sydney in Australia and his PhD in theoretical particle physics at Yale. He also did postdoctoral research at Berkeley, Harvard, Boston University, and Stanford. On February 8, 2019, in the John Wesley Powell Auditorium of the Cosmos Club in Washington, D.C., President Larry Millstein called the 2,403rd meeting of the Society to order at 8:02 p.m. He announced the order of business, that the evening’s lecture would be livestreamed on the internet, and welcomed new members to the Society. The minutes of the previous meeting were then read and approved. Sundrum began by asking how nature decides where to build any given cluster of galaxies. According to Newton’s Inverse Square Law of Gravitation, very uniform distribution of masses can evolve to a very non-uniform galactic structure. And per Einstein’s Theory of General Relativity, Newton’s law is approximately consistent with electromagnetic laws and spacetime is curved. Space stretches uniformly everywhere, meaning that further away objects move apart more quickly than objects close together. Edwin Hubble confirmed this hypothesis in 1931, observing our neighboring galaxies. Theoretically, if the expanding universe were run backward, the contents of the universe would crash together into a dense hot cosmic soup of subatomic particles, opaque to light. Sundrum said that scientists can confirm this theory through observation of distant light from the dawn of the universe, shortly after the cosmic soup began forming particles 14 billion years ago. This early light comes to Earth as the cosmic microwave background, or CMB, observed by NASA’s WMAP satellite. 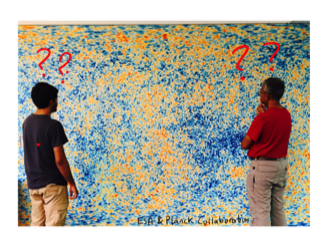 WMAP observes tiny non-uniformities in the color and density of the CMB. Cosmologists have matched these non-uniformities to computer models of the galaxies as created by Newton’s laws. Addressing how the non-uniformities arose, Sundrum said quantum mechanics is an inherently probabilistic law of nature. While it usually operates on microscopic scales, rapid spacetime expansion stretches the effects of quantum mechanics. Energy and matter thus become unevenly distributed on the universal scale. Because of mass-energy equivalence, E=mc2, whereby energy and mass are exchangeable, scientists theorize the universe experienced a growth spurt or “cosmic inflation” before most matter and radiation were created. Sundrum then summed the theory that rapid spacetime expansion led to the creation of matter and radiation, which led to non-uniformities, until ultimately the universe reached a critical mass and ended its growth spurt with a Big Bang. This “cosmic alarm clock” mechanism is yet to be experimentally resolved. Analogizing to steam/water phase transition, Sundrum said as the post-Big Bang Universe expanded and cooled, bubbles formed, collided and stirred the cosmic soup giving rise to gravitational waves. Observing these waves will allow us to “see” further back in time than the CMB, through the otherwise opaque cosmic soup. Sundrum concluding by proposing to use cosmological collider physics as a probe to shed light on a grand unified force. After the question and answer period, President Millstein thanked the speaker, made the usual housekeeping announcements, and invited guests to join the Society. At 10:02 p.m., President Millstein adjourned the meeting to the social hour.